The Allen Memorial Art Museum is the campus museum of Oberlin College, a small liberal arts institution near Cleveland, OH. The collection is encyclopedic in nature and numbers more than 15,000 works of art. As primarily a teaching museum, the Allen is heavily utilized by faculty in numerous departments and programs across Oberlin’s two academic divisions, the College of Arts and Sciences and the Conservatory of Music. The museum regularly partners with faculty in Astronomy, Biology, Chemistry, Computer Science, Mathematics, and Neuroscience to develop curricular programs focused on the collection and tied directly to professors’ course goals and learning objectives. For example, an advanced biology class on human physiology visits the museum for a “lab session” during which the professor hopes to accomplish two learning goals: 1) to develop habits of mind of mind characteristic of high-end cognition and 2) to view from a non-biological vantage the human experience of starvation and more broadly the toll of war on the body and the psyche. Oberlin faculty in non-art disciplines utilize five broad models when teaching with original works of art, namely Visual literacy/Close Looking; Art as Cultural Context; Art as Conceptual Framework; Art as Primary Text; and Art as Creative Focal Point. A museum class visit typically is structured around two or three of these models and always includes one or more exercises in close looking. When dealing with courses in the hard and life sciences, we approach engagement with art slightly differently. Founded on the types of interactions with the collection that STEM faculty tend to request and on the recent pedagogic emphasis on active, inquiry-based learning that also touches on the creative aspects of science, we distinguish four kinds of interactions with art: skill-building, thematic, problem-based and dispositional. Thematic interactions with art are often content-based and focus on course concepts, serving an illustrative or supplementary role. The skill-building approach aims to introduce or enhance particular skills such as critical observation and team work, while with the problem-based one, faculty formulate an assignment around an artwork, for instance computing the volume of an ancient Greek wine drinking cup that would have been used at a symposium. The dispositional approach uses carefully selected artworks to foster specific habits of mind such as deep attention, self-reflection, slowing down, empathy, curiosity, and sense of discovery among others. [i] You can read about concrete examples on the AMAM’s website. In sum, the acquisition of visual analytical skills in STEM disciplines through extended engagement with carefully selected artworks provides a valuable means for learning how to analyze visual content and create a narrative about it; to adopt a broad perspective by contending with the evidence-based arguments of others; to pose questions and make connections; to grapple with ambiguity; and to consider multiple and sometimes equally valid answers. What follows is a brief consideration of three examples of visual analysis exercises that I have used with various science, healthcare, and science skills classes, as well as museum workshops for premedical students. To hone students’ attention to visual detail, as well as verbal and evidentiary reasoning skills, but also to make them more aware of their own assumptions and perceptual biases, preferences, and focus, we show them a diptych by the Chinese artist Hai Bo that portrays three sisters photographed several decades apart (see image above). The class works in small groups to identify – using only visual cues – which sister is missing in the picture on the right. This exercise always yields several hypotheses and a heated discussion. Each group is responsible for defending their view and challenging the other groups’ findings by posing questions or perhaps pointing out inaccuracies or ambiguities. 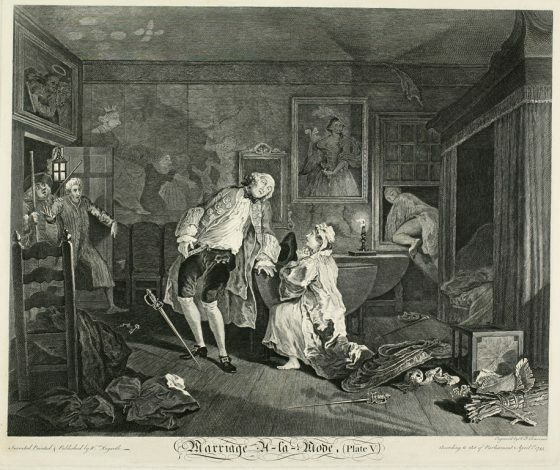 With this print by William Hogarth (above), we give students a twofold task: to create a narrative accounting for all visual elements in the picture and to think about the narrative’s larger implications and contexts. The clarity and abundance of detail afford a rich (and salacious) story. Inevitably the question about the black spot on the collapsing figure just left of center arises: Is it a fatal wound (given the two swords and the figure fleeing through the window), skin condition, or cosmetic intervention? Symptomatic of syphilis, known in England at that time as “the French disease” (or “the disease a la mode”), the black spot signals Hogarth’s critical stance vis-à-vis British society and corrupting foreign influences. Additionally, Hogarth’s obsessive attention to detail provides the opportunity to discuss the new paradigm for scientific learning, which emphasized investigation and first-hand observation over abstract theory. In conclusion it is important to note that these and all visual analysis exercises require plentiful time and one must plan accordingly to create an environment in which students can look closely and slowly and can feel comfortable proffering observations and interpretations. 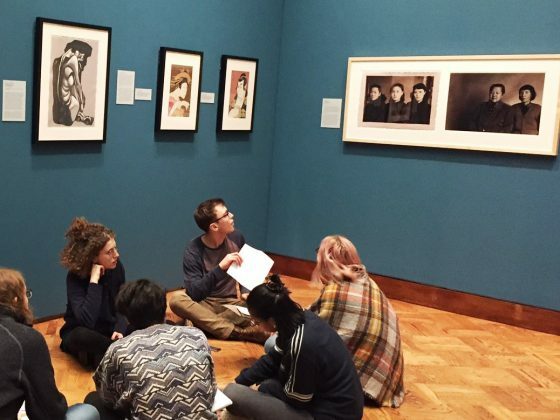 It is helpful to have museum staff or faculty first model this kind of engagement with images. Visual analysis is a tool that can serve any discipline that uses images as sources of information – it gives us a way of thinking with works of art and not necessarily or strictly about art history. 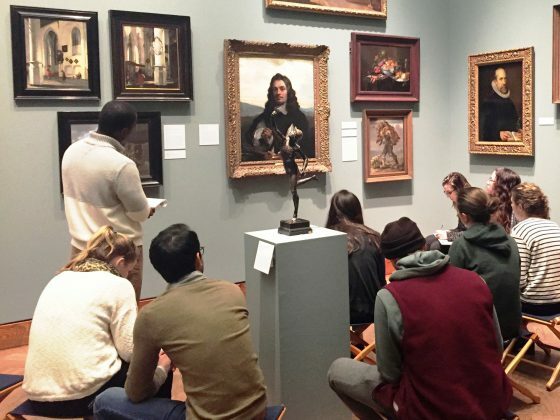 While extensive art historical knowledge is fundamental in guiding students in visual analysis activities and in understanding art’s many contexts, it should not be the focus of class discussion. [i] My colleague Steven Volk, Oberlin College Professor of History Emeritus, coined the term for this fourth approach. [ii] Email correspondence with the author, April 20, 2017. [iv] Most recently, in an article in the January 06, 2017 issue of The Chronicle of Higher Education, University of Washington Mathematics Professor Neal Koblitz argues that STEM undergraduate majors must acquire a wide background in the humanities, which will give them enormous advantage in their careers. One of the reasons he cites is the importance of being able to write effectively and creatively in order for people in the STEM professions to have an impact. Knowing how to tell a good story, he contends, is paramount. [v] For this approach to the painting I am grateful to Valerie Hedquist’s paper presented at the Midwest Art History Society Session at the College Art Association Conference in 2013. 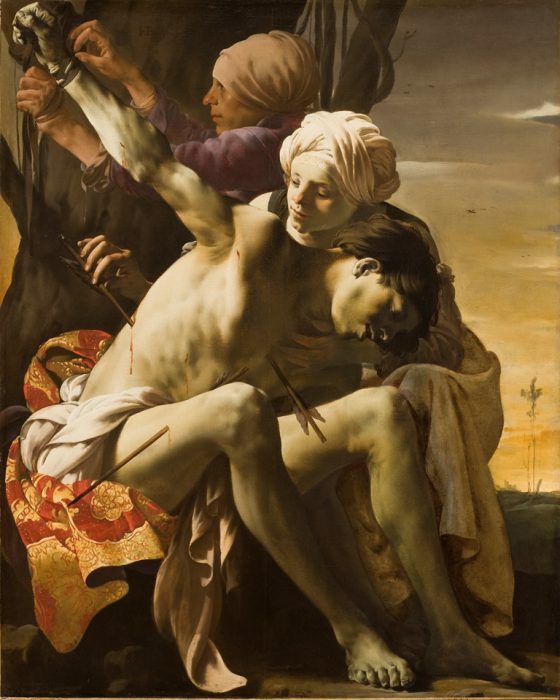 See Valerie Hedquist, “Ter Brugghen’s Saint Sebastian Tended by Irene,” Journal of Historians of Netherlandish Art 9:2 (Summer 2017) DOI: 10.5092/jhna.2017.9.2.3. Note: The version that was published in AHTR Weekly on April 12, 2017 did not include the quote from Prof. Nadya Dimitrova.